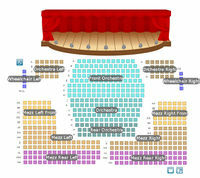 Penn's Landing Playhouse seating chart. Welcome to the New Penn's Landing Playhouse, in The Independence Seaport Museum on the Waterfront in Philadelphia. Lifelong Philadelphia resident and co-producing partners Philip Roger Roy (former owner of Grendel's Lair Cabaret Theater and the New Market Cabaret Theater in Philadelphia) and Dana Matthow (former owner of New York's Soho Playhouse) are delighted to help to fulfill the promise of a great city's waterfront, with a new addition to our performing arts community. We are delighted to be working with John Brady, the President and Chief Executive Officer of The Independence Seaport Museum, who, along with his supportive staff, is making their long established "nautical oasis" a home for theater as well. We hope you will bring your family and friends back, in the very near future, to enjoy a tour of the museum and it's exciting exhibits. Over the next few years we plan to bring many off-Broadway and intimate Broadway shows to the theater, as well as exciting original works. We are thrilled to be creating new cultural opportunities in Philadelphia at this wonderful, beautiful venue with its convenient parking and access to great local resources. We have been producing shows for over 40 years in Philadelphia, New York, and more than 35 cities in the United States and Canada. This page was last edited on 19 September 2016, at 15:17.